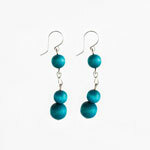 Turquoise Mesi earrings are this month's buyer's choice. Capture that summery feeling with these fresh and funky earrings. Out and about in the May sunshine? Treat yourself to a pair of turquoise 'Mesi' earrings to brighten your look and your mood. These turquoise dangly earrings will complement almost any outfit, whether you are transitioning from day to night and heading out for drinks after work, wanting to glam it up for a party, or going casual chic to a barbeque. Made from sustainable wood, these beaded earrings are not only environmentally-friendly (and guilt-free! ), but also durable and heavenly light to wear - a great addition to your jewellery collection. These earrings are also available in black - see the black earrings here.